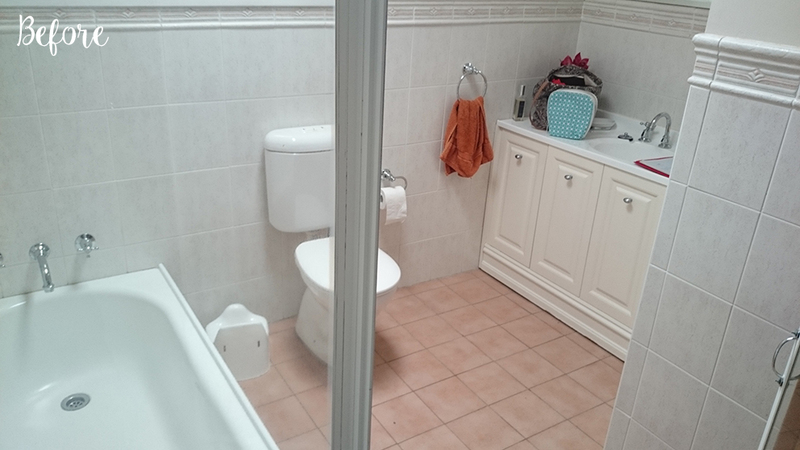 This bathroom was well in need for a redesign to make better use of the bathroom area. 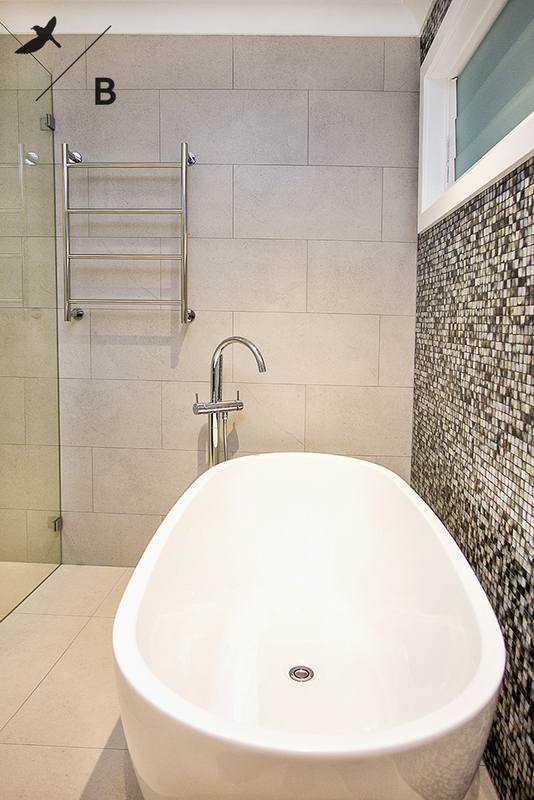 The clients desired the ambiance of a retreat but wanted it to be functional for when grandkids would stay. 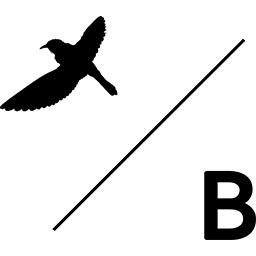 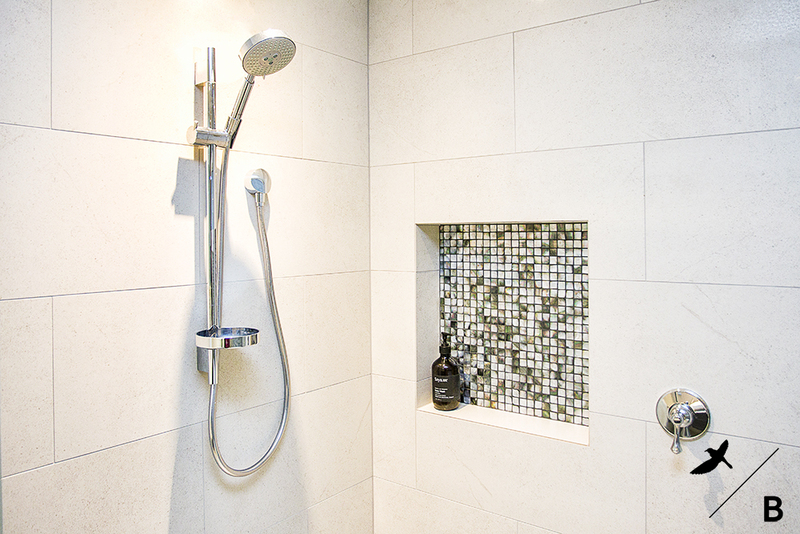 We accomplished this though redesigning the layout of the space, creating a more functional floor plan. 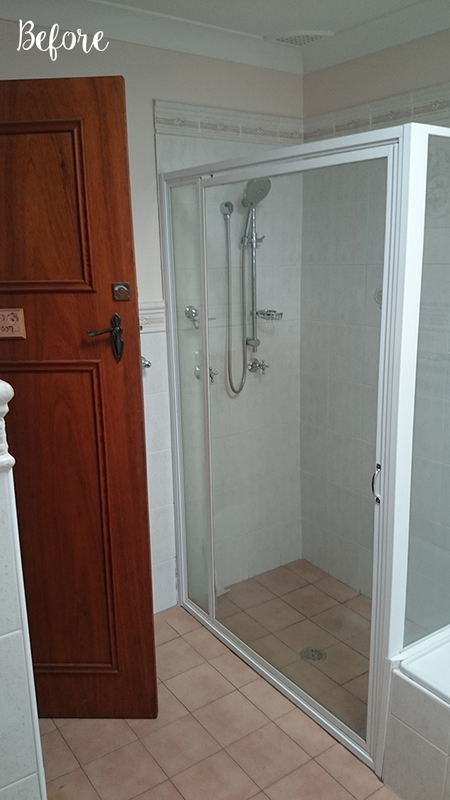 This was done through removing a wall situated in the middle of the space and relocating the entry door. 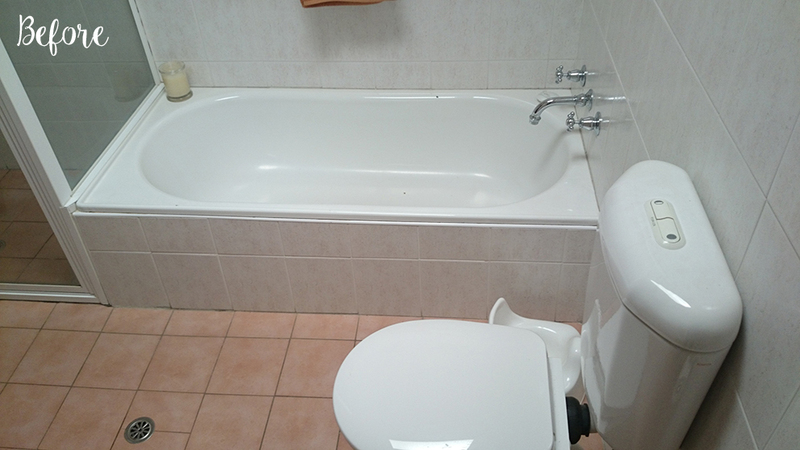 This created the perfect blank canvas. 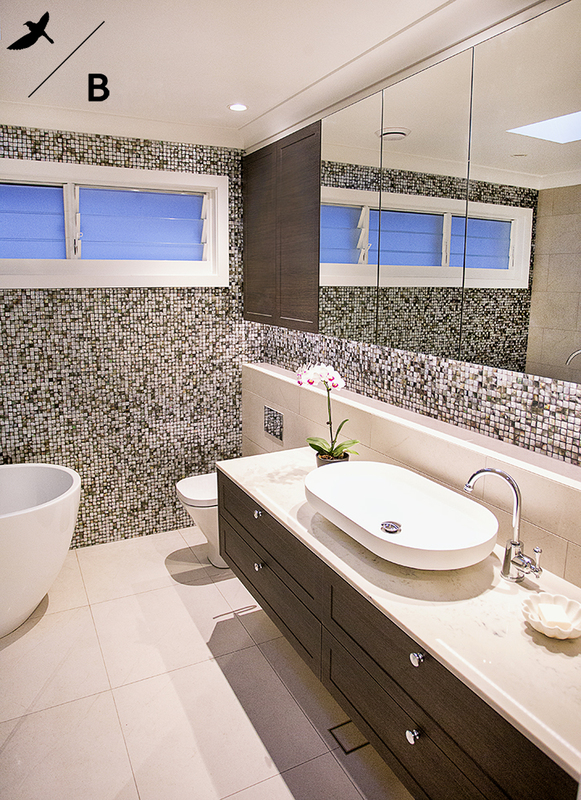 We then replaced the existing window with a larger horizontal window and enlarged the skylight. 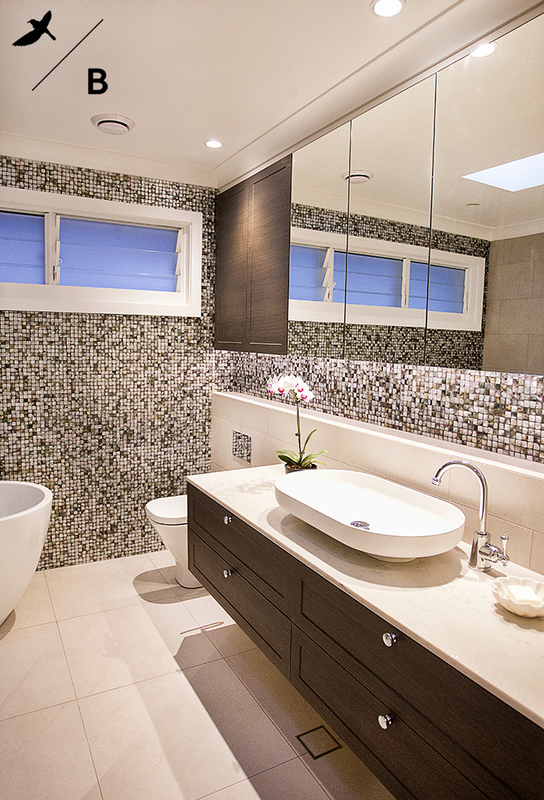 These provide natural lighting, ventilation and privacy to the space. 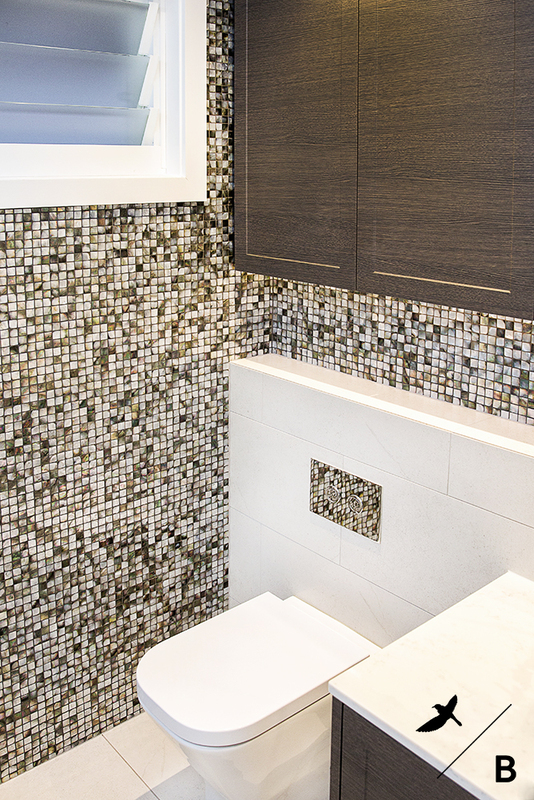 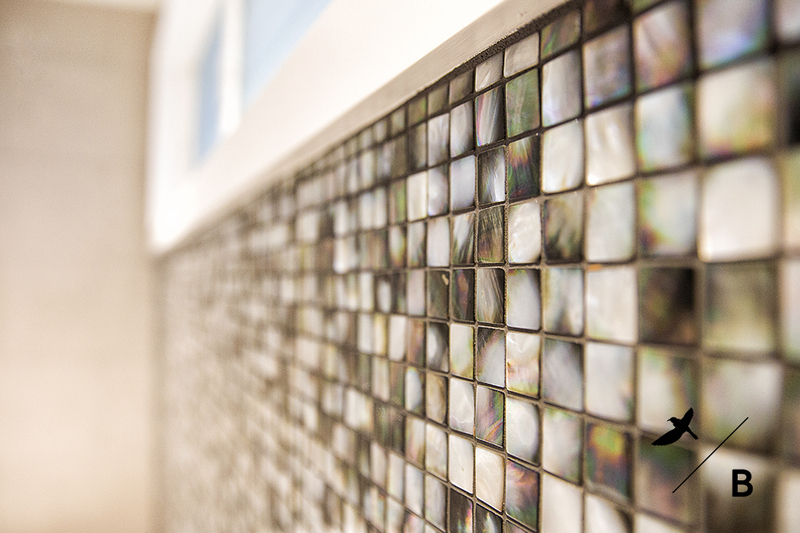 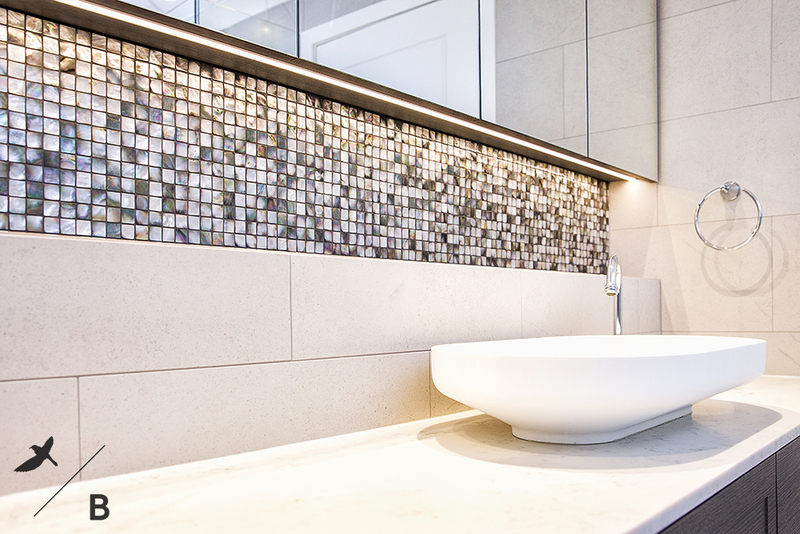 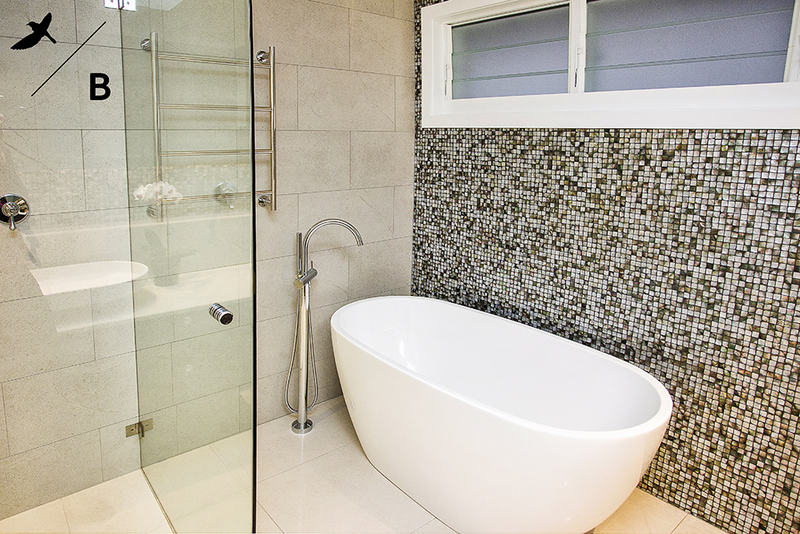 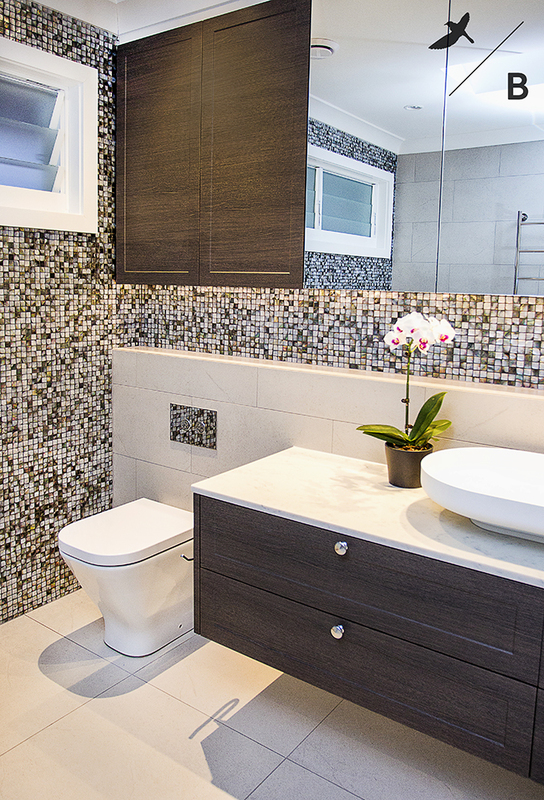 The back wall of the bathroom became the focal point of the room through tiling it with a luxurious shell mosaic tile. 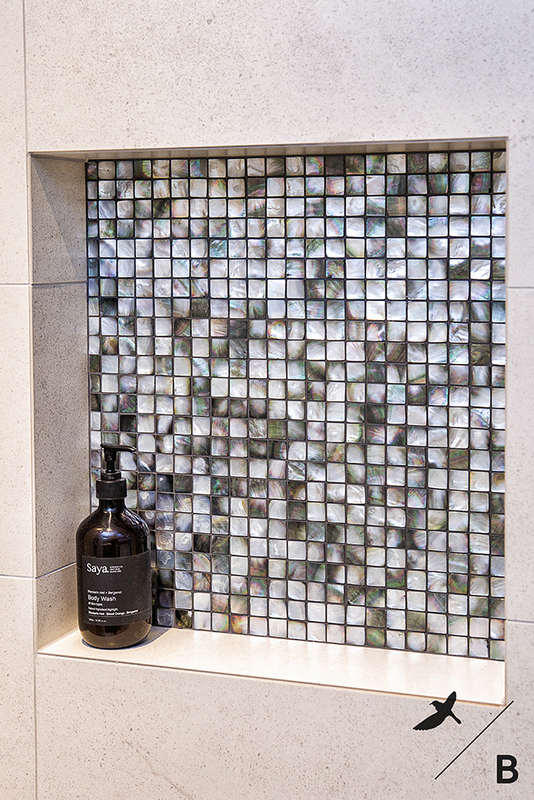 This tile was used in continuation throughout the space, in the shower niche and underneath the overhead cabinetry. 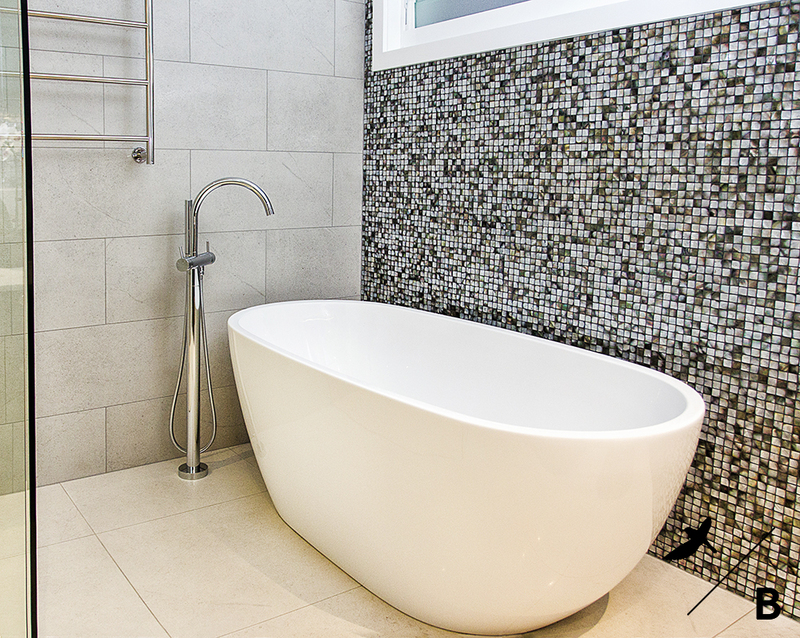 This white freestanding bath pops in contrast to the darky smoky emeralds of the tile behind. 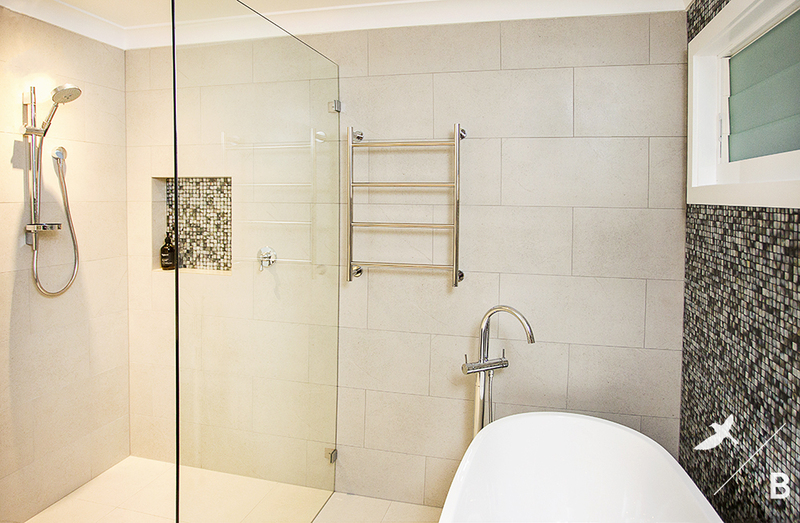 This bath was installed with a handheld shower at bath for ease of bathing grandkids. 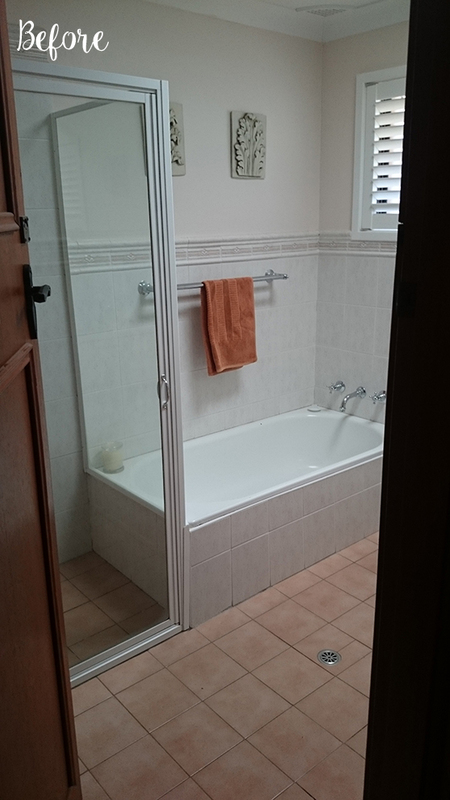 Storage was a high priority for the home owners. 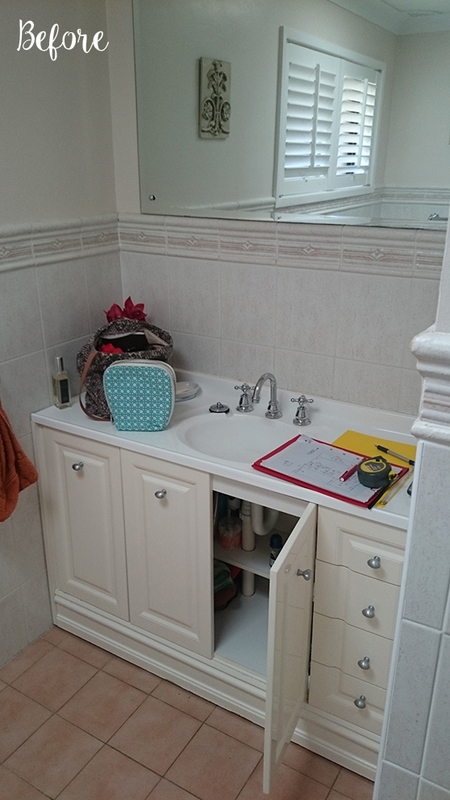 We designed a wall hung vanity and overhead storage units which provided a bounty of space for daily toiletries and bulk storage for cleaning products and extra toilet paper rolls. 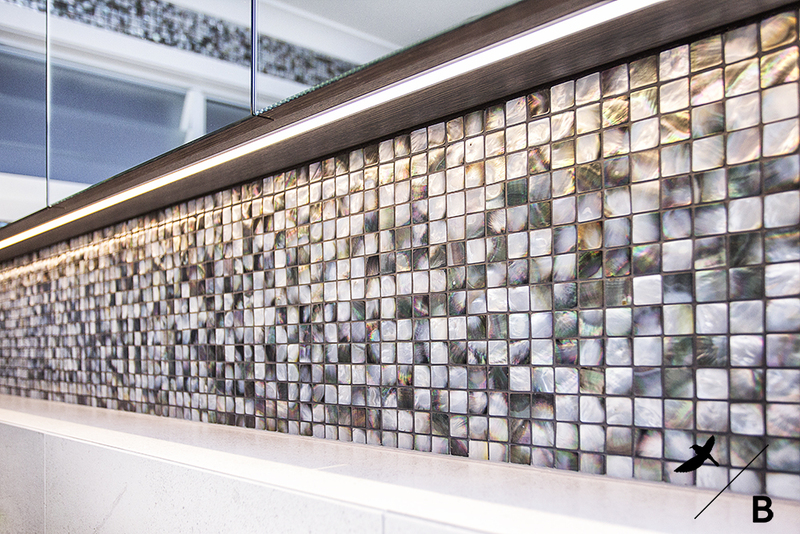 The vanity benchtop uses a reconstituted marble look stone that combines beautifully with the dark timber shaker style vanity, all of which echoe the tones in the shell mosaic. 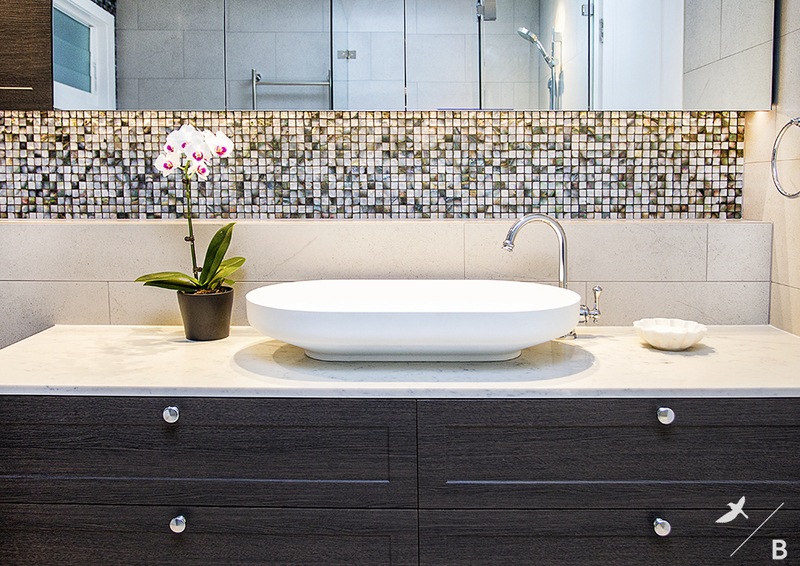 Sitting on top of the vanity is an Omvivo basin which mimics the curve of the bath. 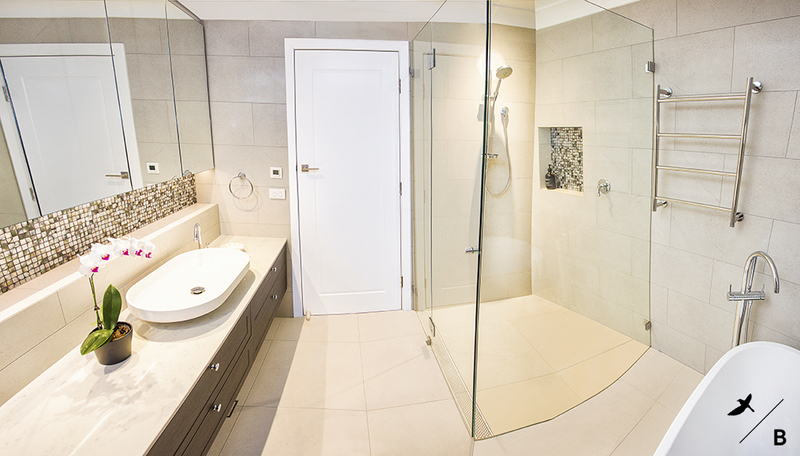 Above that is a recessed niche followed by overhead cabinetry fitted with mirrored doors and recessed LED strip lighting. 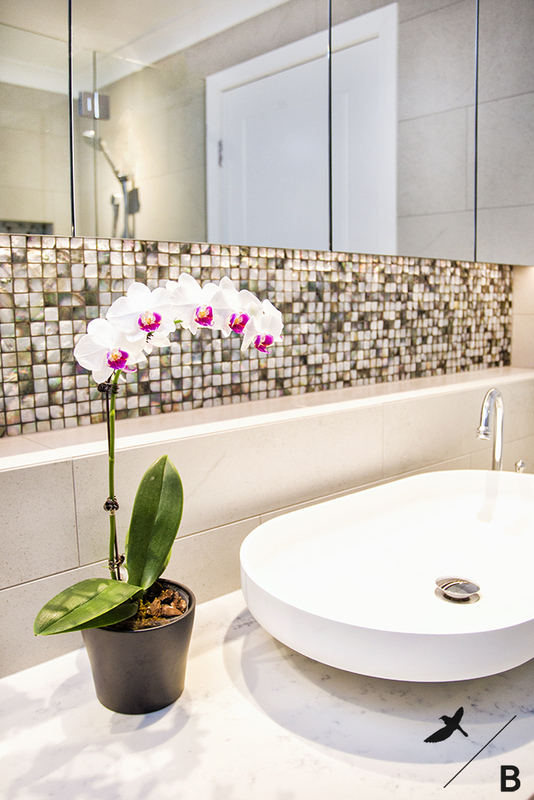 The toilet is tucked behind the vanity, out of sight when we walk into the beautiful space. 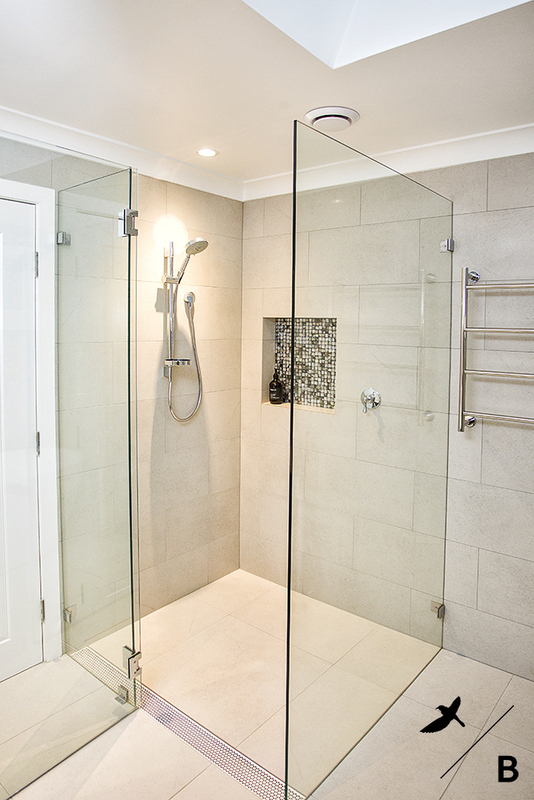 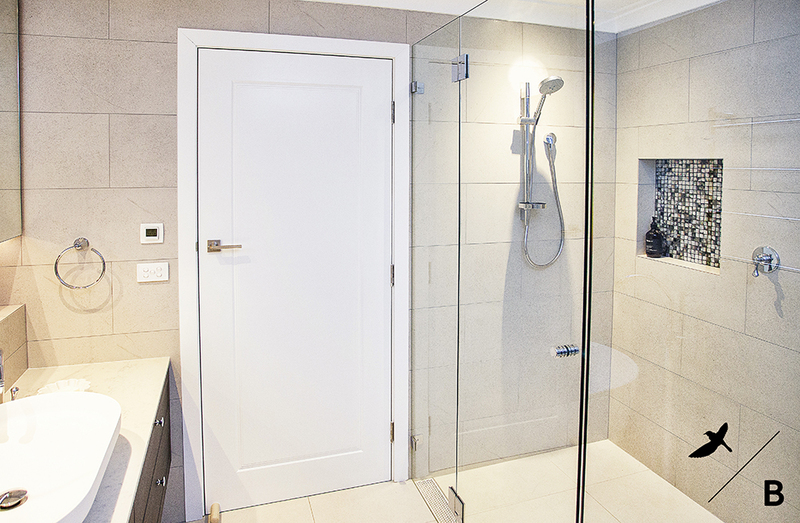 A generous sized frameless glass shower was installed, fitted with a custom shower grate which was powdercoated to blend in with the floor tiles. 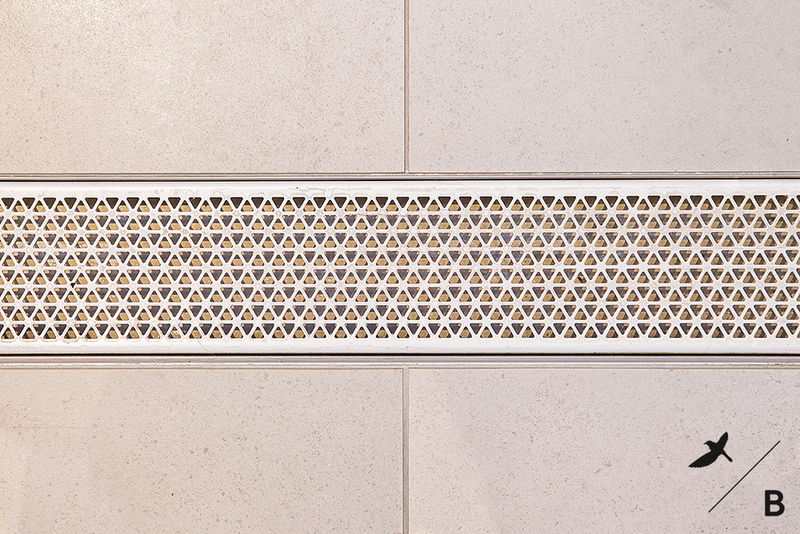 The large format floor and wall tiles have a limestone look which is the perfect neutral tone in contrast with the feature mosaic. 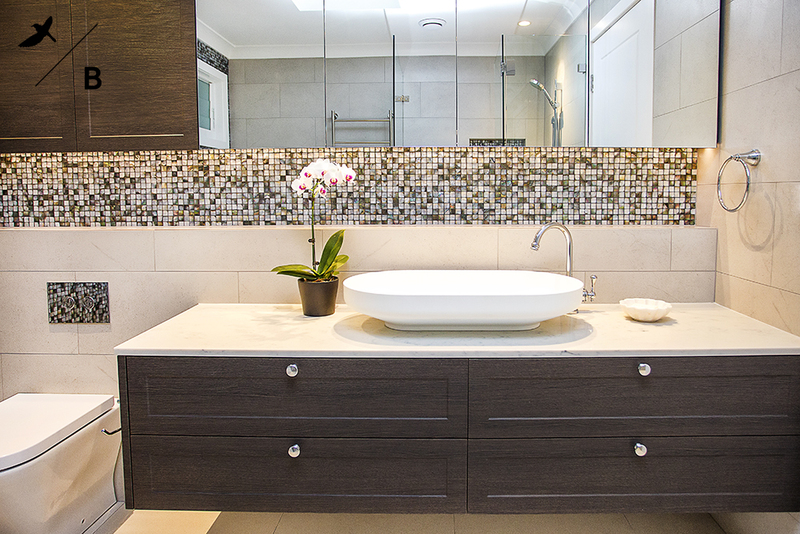 With the use of quality Australian made products accompanied with a harmonious palette of materials we have created a bathroom boasting of retreat ambiance.